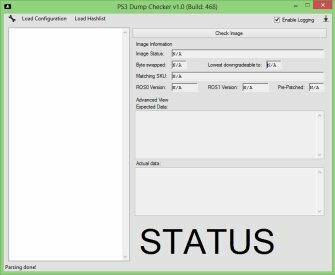 PS3DumpChecker (PS3 Dump Checker) est un outil par littlebalup permettant de vérifier vos dumps de NAND/NOR PS3 pour être sur qu'ils ne soient pas corrompus. Changed: The embedded 4.80 patch replaced by a 4.81 patch build from the FERROX 4.81 CEX custom firmware CoreOS. Added: OFW and Patched 4.81 ROS hashs. Changed: The embedded 4.78 patch replaced by a 4.80 patch build from the FERROX 4.80 CEX custom firmware CoreOS. Added: OFW and Patched 4.80 ROS hashs. Changed: The embedded 4.76 patch replaced by a 4.78 patch build from the FERROX 4.78 CEX custom firmware CoreOS. Added: OFW and Patched 4.78 ROS hashs. Added cisd2 no-wifi entry and one CECHB SKU ID data. Changed: The embedded 4.75 patch replaced by a 4.76 patch build from the FERROX 4.76 CEX custom firmware CoreOS. Added: OFW and Patched 4.76 ROS hashs. Changed: The embedded 4.70 patch replaced by a 4.75 patch build from the FERROX 4.75 CEX custom firmware CoreOS. Added: OFW and Patched 4.75 ROS hashs. Fixed: metldr threshold stats slightly adjusted. Bien sur on n'est jamais sur à 100% qu'un dump est parfait, mais ça permet de faire des vérifications.